I took my parents to a baseball game the other day to see the Fukuoka Softbank Hawks play a pre-season game against the Chunichi Dragons. Unlike most Canadians who follow hockey my sport has always been baseball, so I've been itching to see a game since I got here. 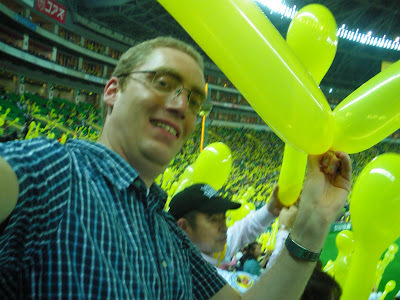 When I lived in the Kansai area I was a Hanshin Tigers fan, which is an experience in itself. But I've decided to become a Hawks supporter since coming to Fukuoka. I can justify it because the Tigers and Hawks are in different leagues so they aren't competing directly with each other in the regular season. Attending a Japanese baseball game is an experience way different than attending a MLB game in North America - at least if you sit in the cheap bleacher seats like I always do. I wasn't sure if it would be the same in Fukuoka as it was at Hanshin Tigers games but was pleasantly surprised to find that the fans here are just as crazy as Tigers fans. They were good sports and I'm sure their cheering helped in the Hawk's victory.